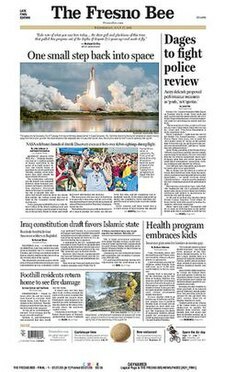 The Fresno Bee is a daily newspaper serving Fresno, California, and surrounding counties in that U.S. state's central San Joaquin Valley. It is owned by The McClatchy Company and ranks fourth in circulation among the company's newspapers. The Fresno Bee was founded in 1922 by the McClatchy brothers Charles Kenny (C.K.) and Valentine Stuart (V.S. ), sons of The Sacramento Bee's second editor James McClatchy. C.K. 's only son Carlos McClatchy became The Fresno Bee's first editor. The two Central Valley newspapers, closely linked by family ownership and editorial philosophy, formed the core of what later grew into The McClatchy Company. In 1926, the McClatchys purchased an older Fresno newspaper, The Republican. The Fresno Republican had been founded in 1876, by Dr. Chester A. Rowell and a group of investors that included inventor and entrepreneur Frank Dusy. In 1932, The Bee took over the subscription lists of The Fresno Republican and merged the newspapers. The paper launched its website in 1996; in November 2005, the paper integrated its online operations into the paper's other departments. The Bee was following the example of The New York Times and other newspapers hoping to combine the creative strengths of the worlds of digital and print journalism. Since 2017, the paper's relationship with their hometown representative Devin Nunes has deteriorated. Nunes took issue with several op-eds the paper had published on his handling of Russian interference in the 2016 elections. Nunes responded by airing TV ads attacking the paper and mailing constituents a 40-page glossy pamphlet solely focused on attacking the Bee's reputation. ^ Fresno Bee staff (November 14, 2018). "Tim Ritchey returns to Fresno as publisher of The Fresno Bee". The Fresno Bee. Retrieved April 20, 2019. ^ "The McClatchy Company Newspapers: The Fresno Bee". The McClatchy Company. Archived from the original on 2007-01-18. Retrieved 2006-12-27. ^ "About the McClatchy Company: History". The McClatchy Company. Archived from the original on 2007-07-10. Retrieved 2007-05-31. ^ a b Baron, Zach (19 December 2018). "The Fresno Bee and the War on Local News". GQ. ^ Schatz, Bryan (3 October 2018). "Devin Nunes' War on the Media Just Got Even Weirder". Mother Jones.